Tiger oak is lumber produced by a particular milling process called quarter sawing. The process results in lumber with a distinctive grain that is often used in high-end applications in which the appearance of the wood is an important consideration. The process is not limited to oak, and many other kinds of wood are quarter-sawn. 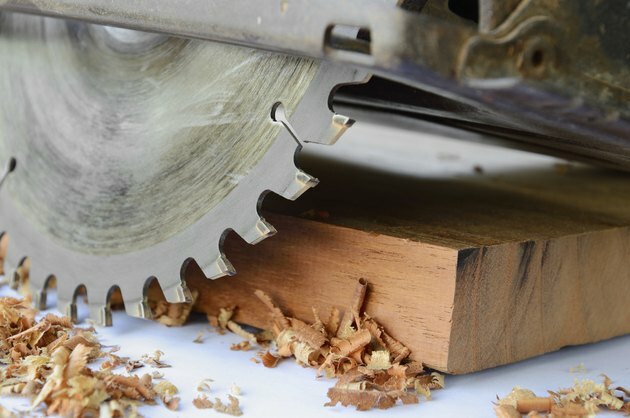 A close-up of a lumber saw cutting through a piece of timber. In quarter-sawing, the log is first cut longitudinally into wedge-shaped quarters. Then the quarters are cut along each plane of the wedge, with the cuts running radially toward the center of the log. The cuts are made alternately on each face of the wedge, producing narrower and narrower boards as the wood is cut away. This method of sawing keeps the grain of wood roughly perpendicular to the surface of the lumber. Because the grain of quarter-sawn wood is straighter than that of flat-sawn lumber, the quarter-sawn wood is significantly more stable. The straight grain is generally thought to have a superior look to the grain of flat-sawn wood, in which the grain is parallel to the surface of the lumber and tends to accentuate the loops and swirls of the grain. The quarter-saw method also reveals the medullary rays in the wood, distinct stripes that add an attractive character to the wood. Quarter-sawing produces less lumber from each log than flat-sawing, and it requires more labor because of the necessity of rotating the quarter before each cut. These disadvantages add to the cost of the wood, and the added cost can outweigh the primarily cosmetic benefits for most typical applications. Because of the straight, fine grain of quarter-sawn wood, and because the grain of wood tends to have a more consistent grain than that of flat-sawn wood, it is well-suited to applications such as high-quality wood flooring. The attractive grain patterns typically present in quarter-sawn wood also make it a good choice for fine furniture and architectural details; it was used often by artisans working in the Arts and Crafts and Prairie styles. What Are the Characteristics of Mahogany Wood?